A new sophisticated strain of ransomware called GandCrab has been wreaking havoc since early February. It turned out to be revolutionary to an extent as it has pioneered in accepting altcoins for ransoms that no other blackmail malware family has used before. Furthermore, it boasts a diversified distribution routine that keeps evolving. What is the GandCrab ransomware? GandCrab represents a new generation of ransom Trojans featuring well-orchestrated propagation, advanced antivirus evasion, unbeatable crypto and a robust Command and Control infrastructure. With the general decline of ransomware prevalence on the cybercrime arena since late 2017, the emergence of a sample as high-tech as this one is quite an event. At the time of this writing, the architects of this extortion wave have released GandCrab v2.1. It is hardly different than the original variant, except that the spreading workflow has become more flexible. As before, the latest edition of the culprit adds the .GDCB extension to encrypted files and drops a rescue manual named GDCB-DECRYPT.txt. The tweak in the distribution methods is tangible. Whereas the previous version made the rounds via exploit kits, including RIG and GrandSoft, the current one reaches computers via malicious spam. Although this appears to be a downshift in terms of technical complexity, the success rate of payload deployment has probably grown. The adversaries leverage a botnet to mass-mail potential victims. The phishing emails being sent pretend to be receipts, with the subject being “Receipt Feb-[random numbers]”. The body of the message is prosaic, saying, “Document attached”. The catch is all about the attachment camouflaged as a PDF file. Once a recipient opens it, they end up on a screen with a captcha where they are supposed to put a checkmark to confirm they aren’t a robot. Next, the rogue PDF object downloads a booby-trapped Microsoft Word file from butcaketforthen.com web page and loads it. Then goes a garden-variety “Protected View” notice asking the victim to enable editing and thus run Office macros. The malicious macros, in their turn, download and fire up a PowerShell script that completes the infection chain and executes the GandCrab ransomware binary on the targeted host. The perpetrating program first traverses the contaminated machine’s hard disk partitions, removable drives and network shares in search of potentially valuable data. Before encrypting the detected items, it ends multiple processes that may be currently using some of the would-be hostage files. It also determines the victim’s IP address and geolocation in order to display this information in its decryption service page later on. Having received a public encryption key from its C2 server, GandCrab performs the data crippling job by means of RSA, asymmetric cryptographic algorithm. A notable byproduct of this file skewing, aside from denial of access, is the concatenation of the .GDCB string to every encoded entry. The ransomware also leaves its recovery how-to document, GDCB-DECRYPT.txt, in folders with hostage data and also drops a copy on the desktop. Ultimately, the victim is instructed to visit the “GandCrab Decryptor” page. It is a Tor hidden resource designed for processing the ransom payments. The infection demands 1.54 Dash, a form of cryptocurrency that’s used by ransomware makers for the first time. No matter how big the temptation might be to pay the cybercrooks, get the data back and move on with your day, be sure to try everything else first. Start with the steps below to remove the GandCrab ransomware and check whether forensics can do the trick in terms of data recovery. It’s important to know that the GandCrab virus creates copies of your files and encrypts them. In the meanwhile, the original files get deleted. There are applications out there that can restore the removed data. You can utilize tools like Data Recovery Pro for this purpose. 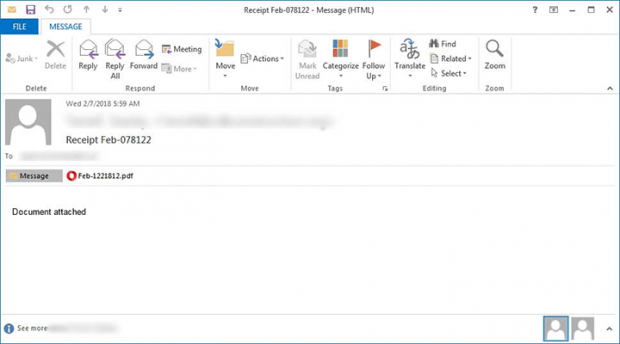 The newest version of the ransomware under consideration tends to apply secure deletion with several overwrites, but in any case this method is worth a try.